While still riding the waves of success with his sophomore book entitled, Racism From the Eyes of A Child (available worldwide/Amazon), music mogul and best-selling author, Mathew Knowles, PH.D. is poised to release his third title, The Emancipation of Slaves Through Music, under his Music World Entertainment book imprint. With worldwide interest in his book’s subject, Knowles has been on an international media and lecture tour, discussing the timely topics found inside the pages. With the effects of racism and systematic discrimination making headlines today, he takes us back to the era he grew up in, in Gadsden, Alabama, during the height of segregation and civil protests. A riveting read, RFEC encapsulates how racism has woven itself into the very fabric of America. By revisiting his personal experiences with racism in America, his book challenges readers to do the same. He encourages readers to comb their own family histories for heroes who fought discrimination through the years. He points to the attitudes of slave owners who first programmed colorism into the black community due to their own preferences. 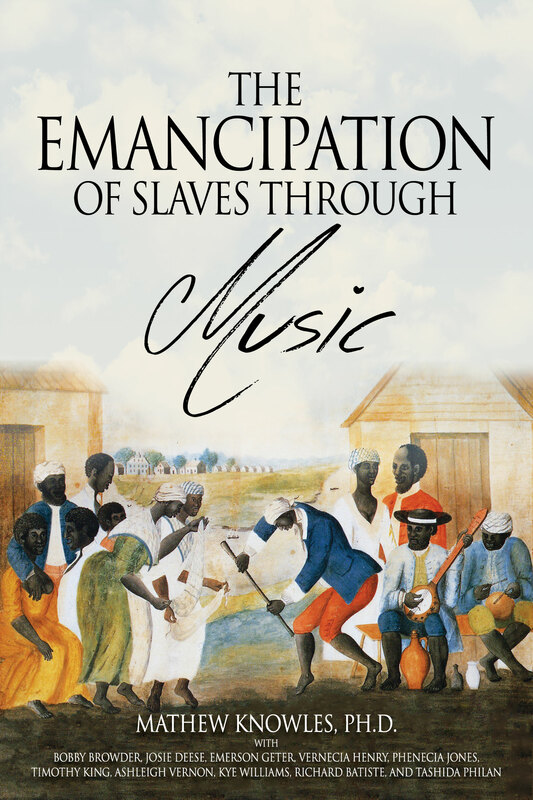 With his newest release, The Emancipation of Slaves Through Music, he and his Entertainment/Recording/Management (ERM) degree program students at Texas Southern University, undertook exhaustive research and compiled how music was used to liberate the spiritual, if not physical, enslavement of African captives, and how it is similarly used today to empower liberation. From dances to the culture as a whole, the book also covers all of the influences of the African people wherever the landed in the world. The book brings together the understanding of how even instruments, such as the guitar and banjo, and the–once forbidden on plantations–drum, helped shaped every genre of music today while tracing their origins back to the Motherland. It’s an informative read that helps any music lover appreciate the power of music. More than anything The Emancipation of Slaves Through Music takes us on a journey of slaves from Africa to America. It gives the reader insight of how music was the tool used to get them through the day, communicate, spiritually uplift and often to escape. The Emancipation of Slaves Through Music gives us another dimension of slavery and its lasting impact on today’s culture. After media appearances, everywhere from The Wendy Williams Show to National Public Radio, Knowles will continue speaking and engaging audiences, as his newest book slides in on the heels of his still popularly selling others.